It is with great sadness that I beg your prayers for the soul of my brother priest and our longtime pastor, Father Eugene Alves, who passed away this afternoon. Father Alves devoted his entire life to Our Lady of Good Voyage Parish. In so many ways, Father Alves was larger than life; and he will live on in the hearts of generations of parishioners who were blessed to know him, love him, and learn from him. Michael D. O’Brien is a Canadian-born Catholic artist and novelist. 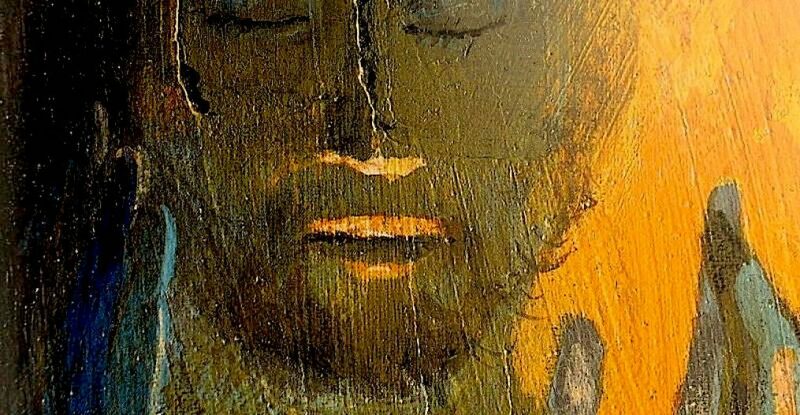 His many paintings depict the life of Christ, the lives of the saints, or scenes from the scriptures. But he is best known for his books, especially his seven volume series about the Last Days. More than twenty years ago, I stumbled upon one of O’Brien’s novels during a long rainy afternoon in a bookstore. Decades later, I have read all of his books more than once. Some of them I read almost every year. They are that good. But they are all challenging. In each novel, Michael O’Brien introduces a central character who is called upon to confront some form of human suffering. In one book, the central character is a lonely man who struggles to live a chaste single life in a world seemingly gone mad. In another book, the protagonist is a priest and survivor of the Holocaust who is asked to preach truth to a master of lies. All of O’Brien’s books contain tragedy, but all of them are tightly laced with love and hope. In “Island of the World”, Michael O’Brien tells the story of Josip Lasta, the only child of a poor schoolmaster and his wife. This small but happy family lives in a village high in the mountains of Bosnia. As the Second World War rages, the entire village is brutally murdered by a faction of radicals that would eventually align themselves with the post-war Communist government of Yugoslavia. Only Josip survives. Later, as a brilliant young scholar, Josip is arrested for sedition, wrongly convicted, and sentenced to hard labor on an island prison where he is beaten and tortured. During a storm, Josip escapes, swims to shore, and walks hundreds of miles into Italy where he is eventually nursed back to health (mentally and physically) by a caring family of strangers. Over the years, through moments that can only be described as miraculous, Josip finds his way to Christ. As decades pass, Josip lives in New York City and works as a custodian. Later in life, he returns to his native land and finds peace in unexpected ways. From time to time, he is presented with opportunities for revenge against those who caused him so much pain and suffering. But because of his deepening relationship with Christ, Josip chooses the path of love, forgiveness, and reconciliation. Over and over again, through movements divine grace and human will, he chooses love over hatred; forgiveness over vengeance; reconciliation over alienation. In the end, the life of Josip Lasta is the story of a life healed by love, redeemed by love, and sanctified by love. It is the story of holiness in a world that is routinely cursed by animosity, bigotry, and senseless violence. It is the story of a hard life built and re-built on the enduring and eternal foundations of faith, hope, and love. I feel especially blessed to have finished this novel (again) just as we pray together this weekend with Saint Paul’s discourse on the Way of Love. Paul writes: “Love is patient, loveis kind. It is not jealous, it is not pompous, it is not inflated, it is not rude, it does not seek its own interests, it is not quick-tempered, it does not brood over injury, it does not rejoice over wrongdoing but rejoices in truth. It bears all things, believes all things, hopes all things, endures all things. Love never fails (1 Corinthians 13:4-8).” All too often, life presents us with situations that prompt us to anger, frustration, and opportunities to tear people down. At the same time, God’s word offers an alternative that transcends our basest and ugliest human inclinations. Again and again, the Lord offers us the chance to choose love. When we do, lives are changed and miracles can happen — because love never ever fails. More than eight centuries ago, the Crucified Christ called out to the young man who wouldbecome Saint Francis of Assisi: “Go! Rebuild my church which as you can see is falling into ruin!” Francis took the Lord’s command literally and set out to repair and rebuild small chapels in and around his hometown. Over the years, however, Francis came to understand that his commitment to living the Gospel and sharing God’s love was instrumental in rebuilding the Church throughout the world. In this spirit and in appreciation for the crisis facing the Roman Catholic Church in our own time, the Catholic Community of Gloucester & Rockport will gather on important feast days throughout the year to pray for the healing of God’s family and for the courage to rebuild our wounded Church. In addition, we will ask the saints to pray for us and guide us in the hard work of discipleship during these difficult times. In anticipation of the Feast of Our Lady of Lourdes and the World Day of the Sick, all are invited to join us for our next Evening of Prayer & Reflection for the Healing of God’s Family on Friday, February 8th from 5:00pm until 7:00pm in Our Lady of Good Voyage Church. This special evening of prayer will begin at 5:00pm with Evening Prayer and Exposition of the Blessed Sacrament. During Evening Prayer, Cliff Garvey will offer a brief reflection on prayer and healing during times of poor health. After a Holy Hour of silent adoration, we will pray the Rosary at 6:30pm for the healing of God’s family. And we will conclude with Night Prayer and Benediction at 7:00pm. For more information, please contact Cliff Garvey at cgarvey@ccgronline.com. Please join us for all or even just part of this special evening of prayer! All are invited! All are welcome! Our Lady of Lourdes, pray for us! Each day of our Catholic Kids Camp will begin with Mass at 8:00am in Our Lady of Good Voyage Church. All parents, grandparents, and guardians are encouraged to join us! After Mass, Betsy Works and a team of volunteers will lead the children to Our Lady’s School for a faith-filled and fun-filled morning of activities, learning, and good times with friends both old and new. Catholic Kids Camp is an exciting educational program that your children and grandchildren will love! The tuition for this innovative youth faith formation program during the winter school vacation is just $30 per child for the entire week. Scholarships are available for those families who cannot afford tuition. Also, adults and older children (age 12 and up) are welcome to join us as volunteers and will be much appreciated! Registration forms are available at the link below. For more information about youth faith formation in the Catholic Community of Gloucester & Rockport, please contact Betsy Works at bworks@ccgronline.com. Please join us! All are invited! All are welcome! Francisco Marto (1908-1919) and Jacinta Marto (1910- 1920), brother and sister, and their cousin, Lucia dos Santos (1907-2005), were children from a small village near Fatima in Portugal, who were blessed to give witness to several apparitions of the Blessed Virgin Mary under the title of Our Lady of Fatima. Much is known and much is often misunderstood about the apparitions and their meaning. But we can learn a great deal from these children, especially Francisco and Jacinta, about life, love, prayer, and healing. In commemoration of the Feast of Saints Francisco Marto and Jacinta Marto (February 20th), all are invited to join Father Jim and Cliff Garvey for a “Winter Day of Prayer& Reflection: Prayer and Healing with the Children of Fatima” on Saturday, February 23rd in Our Lady of Good Voyage Church. During this special four-hour morning retreat, we will explore the different but complimentary spiritual lives of the Children of Fatima. We will also consider what these young saints can teach us about coping with illnesses of mind, body, and spirit. Our day of prayer and reflection will proceed according to the following schedule: Celebration of Mass at 8:00am; First Reflection & Faith Sharing at 9:00am; Eucharistic Adoration & Rosary at 10:00am; Second Reflection & Faith Sharing at 11:00am; Angelus & Closing Prayers at 12:00pm. After our program, all are invited to join us for a delicious potluck lunch in the parish hall. Throughout the morning, there will be scheduled breaks and time for faith sharing, fellowship, and questions. Coffee, tea, bottled water, and refreshments will be available throughout the morning. During Mass, a collection will be taken up in support of our adult and youth faith formation programs. If you would like to participate in this special event, please contact Cliff Garvey at cgarvey@ccgronline.com. Please join us! Bring a friend! All are invited! All are welcome! Established in 2014, the Catholic Community of Gloucester & Rockport is a collaborative of two historic parishes: Holy Family Parish and Our Lady of Good Voyage Parish. Working together as a Roman Catholic community united in prayer, fellowship, and service, we are committed to living the Gospel of Christ, sharing God’s love and mercy with all people, and rebuilding the Church in Gloucester & Rockport. All are invited! All are welcome! Always!